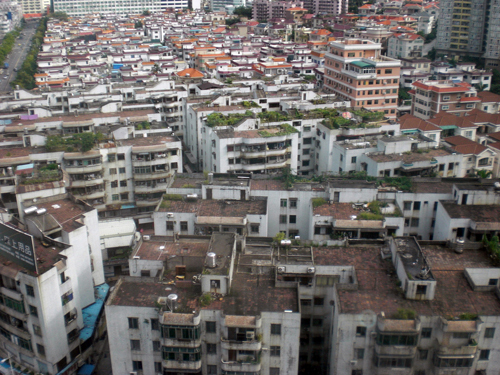 Dongguan Housing. Photo by livinginchina4now. Several people have called my attention to a recent article from The Telegraph about China ‘creating the largest mega-city in the world with 42 million people‘. The title of the piece is a bit misleading as the government is not planning a new city per se, but rather combining a group of nearby cities into one huge ‘mega-city’. The targeted group of cities make up the Pearl River Delta region in China’s southern Guangdong Province. Home to China’s famous first tier cities Guangzhou and Shenzhen, the Pearl River Delta is already one of the most populated places on earth. It is the manufacturing powerhouse of the country, thanks in large part to it being the first economically liberalized region after Reform and Opening Up. As a result of this, the Pearl River Delta has absorbed ambitious migrants from all over China for the better part of three decades. In addition to Guangzhou and Shenzhen, the proposal calls for integrating smaller (albeit still in the millions population-wise) cities of Donggaun, Foshan, Huizhou, Zhaoqing, Jiangmen, Zhongshan and Zhuhai into one. Upon first reading, the proposal doesn’t make much sense as the Pearl River Delta region has done an excellent job already of linking transportation and infrastructure among its different cities- so why the need to amalgamate into one city? This is the key. The Chinese government still enforces the hukou household registration system for its citizens, making it difficult for people who move from one city to another to use the services offered by their new city. Restrictions for migrants to new cities are not only limited to healthcare and educational services, but to investment opportunities as well such as starting a business or purchasing a new home. By amalgamating the cities of the Pearl River Delta into one ‘mega-city’, this gets rid of the bureaucratic restrictions of the hukou registration. Now, the migrants who have left their native homes and settled in the Pearl River Delta can move more freely around the region. This is much more than semantics- it is a huge step forward in the liberalization of movement and opportunity for its citizens. It is unbelievable that The Guardian piece makes no mention of the significance of this development. Now there are reports that the story of the Pearl River Delta mega-city is false. According to an AFP report, China denies plan to create world’s biggest city. The error made by the original Telegraph article is most likely due to a misunderstanding by the reporters. As I mentioned above, the title was highly misleading- nothing more than a sensational headline designed to get reader attention. And the consultants quoted in the original article are city planners- professionals whose job it is to make recommendations on how to go about development- not the final decision makers who approve projects. The fact that the Pearl River Delta is not going to become one ‘mega-city’ doesn’t necessarily take away from the interest in integrating the region, making it a place where services are shared and the ease of mobility between its cities is increased.